The ABCCMM, the Brazilian Mangalarga Marchador Association accepted two US vets into their training program to become certified inspectors of the breed. 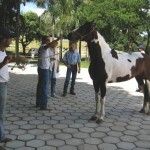 The Mangalarga Marchador registration process in Brazil requires that every horse be inspected at age three for gait, conformation and temperament in order to be fully registered and entered into the breeding registry. The USMMA is dedicated to maintain the quality and hardiness of the breed in the US as well and this is a historic first step. Dr. Tia Nelson and Dr. Hugh Rogers are the first non-Brazilian veterinarians to attend the inspection and technical school. In addition, Dr. Nelson is the first woman inspector. Both may also serve as judges for the USMMA at shows. The training involved classroom study and field work performing actual inspections at MM breeding farms under the guidance of a trained technician and vet, Dr. Getulio Tadeu Vieira. While in Brazil, the vets also went to horse expositions and other training facilities to learn the versatility of the breed. The US vets will continue training with the Brazilian inspector during his visit to the US this summer. For more information on the Marchador horse, please visit the association website at http://usmarchador.com. From L to R: Groom, Getulio, Tia, Hugh in Brazil. ABCCMM Inspection August 2015 Photos!